Car design from the inter-war years simply oozes class. The teardrop bodies created for Delage, Bugatti, Alfa Romeo and others during the 1920s and ’30s by Saoutchik, Figoni & Falaschi et al are amongst the most achingly gorgeous in automobile history. Certainly they are unrepeatable. Or are they? 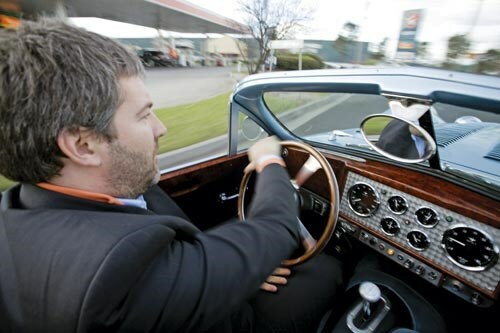 Melbourne Industrial Designer, David Clash built the first Devaux, a Coupe, back in 2002. 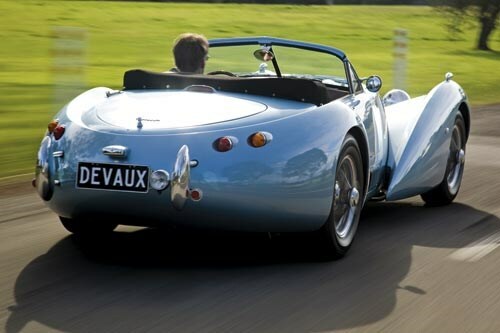 Now he’s back with this jaw-dropping Devaux Spyder. 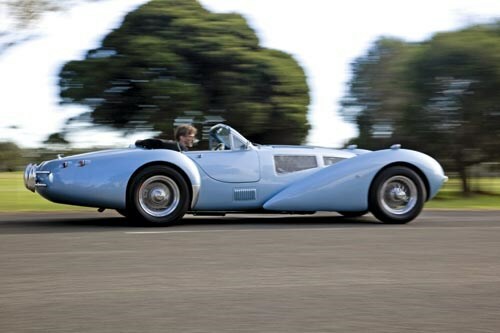 The open-top body is Clash’s work, the origins of which can be traced back to 1988, and like the Devaux Coupe, isconstructed from hand-laminated GRP. The cockpit is typical 1930s with its knurled aluminium dash plaque fitted with bespoke-faced VDO instruments. What’s not so typical is the fitmentof air-con and heating, while the floors are fully carpeted and the seats and doors are swathed in leather. 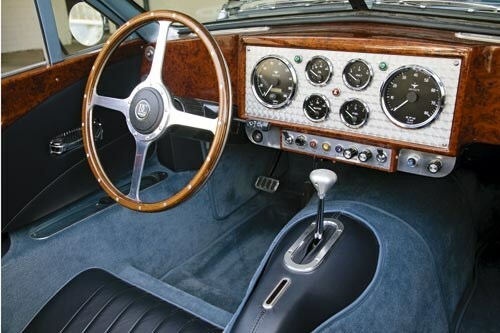 The ‘wood’ trim is actually photographic veneer, coated with numerous layers of varnish, whilethoughtful handmade touches include billet air-conditioning vents on the dash-top and the auto-shift indicatoratop the transmission tunnel. Built on a mild-steel chassis frame with an internal glass-fibre tub and scuttle the Devaux Spyder sits on 16-inch spoked-wires, with Dunlop 215 70 R16 rubber, and boastspowerful 300mm disc brakes all-round. There’s a Borg Warner axle, with a 3.45:1 diff, four-bar links and a Panhard rod with coil-over dampersat the rear. Front suspension, by Rod-Tech, consists of fully-adjustable stainless steel double wishbones with coil-over dampers. Underneath the skin is a custom-built 85-litre aluminium fuel tank, and a bespoke radiator that is so painstakingly constructed, it’s a shame it is hidden from view. Best news for horsepower fans is that powering the roadster is a 270kW/470Nm Chevrolet LS1 5.7-litre V8, hooked up to a four-speed automatic transmission. Trainspotters will note the Jaguar steering column, door handles and brake booster among other items, but there are also many bespoke parts on the car. Clash designed and laser-cut the bonnet stay, hinges, clips, covers, radiator grille and window surrounds, and there is also a beautifully-made wiring loom. 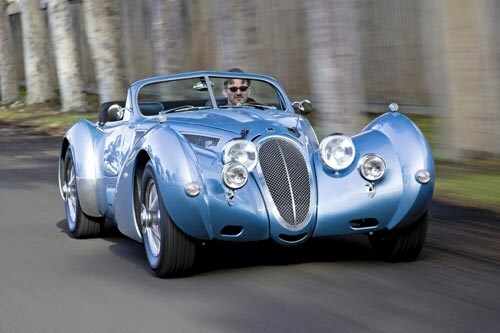 Based on the Coupe, the new Spyder didn’t require a ground-up re-design, as the body is not load-bearing. Most of the work therefore was in reshaping the boot and rear deck, adding quarter lights and strengthening the window frame, and in making the clever hood mechanism. 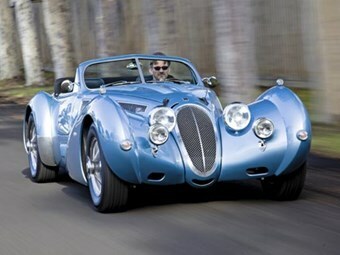 At nearly 5.0m-long, and presented in Blue Ice, the Devaux Spyder is an imposing sight: and an imposing drive. It is a clumsy affair slinking into the cockpit but once in, I was reasonably accommodated despite my left knuckles scraping the left-side door panels when turning the timber-rimmed LHD Moto-Lita steering wheel. With an extra-wide transmission tunnel(almost mandating a two-feet pedal driving style) and a fairly narrow track, accommodating my 189cmframe was a stretch. So as a long-distance interstate tourer, the Spyder is not my first choice. From the driver’s seat, the split windscreen provides an expansive view over the long 128-louvrebonnet. 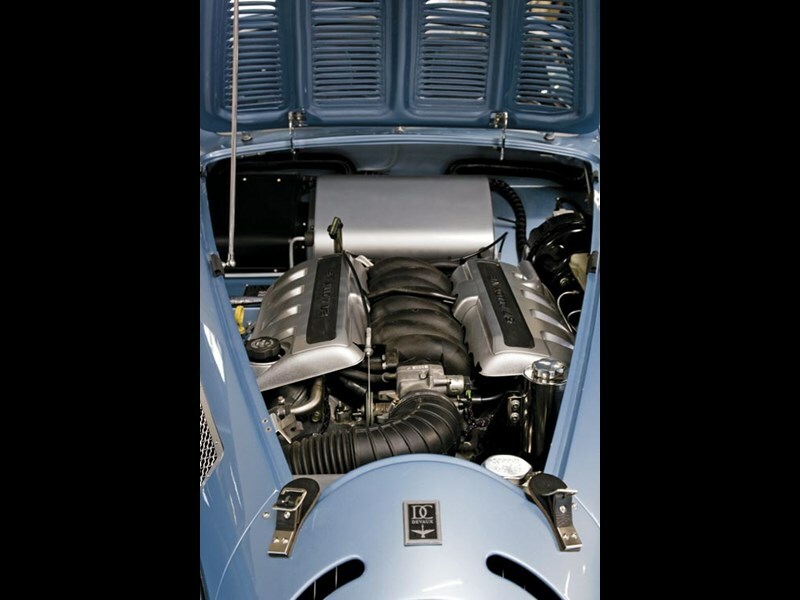 Appropriately, all that is required is a push of the dash-mountedstarter button to fire the bent-eight into life. The big 5.7-litre Chevy V8 sounds fantastic, and is an awesome performer in thislightweight package. So, well aware that the car weighs only 1125kg, it was ‘slow in-slow out’ for the first few miles. With its long wheelbase and particular suspension geometry, manhandling the Spyder around backstreets at slow speeds took some effort, but it lightened up nicely at speed. It’s no spritely track star then, more of a boulevard cruiser, as you may expect. Its Achilles heelis in the steering department, but the powerful modern running gear and disc brakes make it a joy to pilot in all other respects. With only a bit over a ton to haul and 270kW/470Nm on tap, the Devaux is a very fast car in a straight line. Highway cruising and overtaking are performed with easethen, but the real joy of owning a car of this ilk is grabbing the missus, with hamper in tow, and taking a spritely jaunt, via a scenic route, to your favourite picnic spot; all in impeccable style. Eat your heart out Jay Gatsby.